What's driving the toned-down Trump? Analysis: Temporary or not, from foreign trips to funeral preparation, the most unconventional of commanders-in-chief is suddenly hitting some standard presidential notes. WASHINGTON — Don't call it a pivot. Not yet. Maybe it's just a blip. But, for the moment, even some of President Donald Trump's toughest critics are taking note of a shift in his behavior — from reliably disruptive to seemingly disciplined. That's been especially evident since he departed Washington for the G-20 summit in Buenos Aires last week, where he gave a public cold shoulder to Russian President Vladimir Putin and Saudi Crown Prince Mohammad bin Salman, signed a trade deal with Mexico and Canada, canceled a press conference so as not to distract from the mourning of President George H.W. Bush and pulled back from his trade war with China. On the flight home, he said he would agree to a two-week stopgap bill to avoid a government shutdown after months of threatening a showdown over Congress' refusal to provide full funding for his promised border wall. 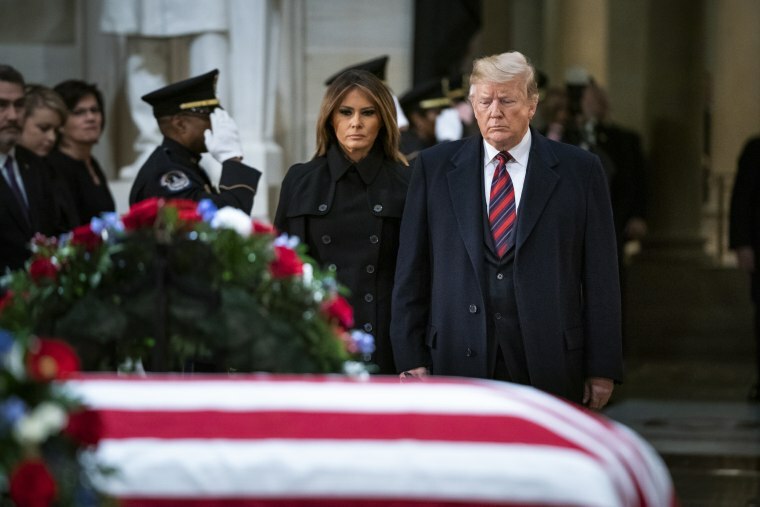 And he has exhibited all the grace in handling Bush's state funeral that he failed to show when Sen. John McCain, R-Ariz., died just a few months ago. "He’s pitching a great game right now," said Sean Spicer, Trump's former White House communications director. "The last six, seven, eight days have been the best string of days in his administration." It's not just Trump loyalists who are noticing a difference. Susan Rice, the former national security adviser to President Barack Obama and no fan of his successor, took to the pages of the New York Times Tuesday to note the president's performance in Buenos Aires. It wasn't exactly praise. Then again, it wasn't criticism, either: "News Flash: No Major Damage Done at G-20!" screamed the headline. She had expected him to do what he normally does, she said — to infuriate allies, embolden adversaries and generally embarrass the U.S. on the international stage. Instead, she was pleasantly surprised. "With Mr. Trump back on American soil, we can safely conclude that, at least this time, we dodged another blow to our national honor, even as we have surrendered our global leadership and become mostly a global bystander," she wrote. "We can only hope that Mr. Trump and his top advisers will now discern that less is more when it comes to this president’s travels abroad." Of course, there are clear exceptions to the trend — one big one in particular. The president has escalated his Twitter attacks on special counsel Robert Mueller's Russia probe, which he calls a witch hunt, particularly in the wake of former Trump fixer Michael Cohen pleading guilty to lying to Congress about efforts to build a real-estate development in Moscow while Trump was campaigning for the presidency in 2016. Still, while Trump has given no indication that he wants to be a "normal" president — after all, his entire political persona is built on the opposite approach — for the past few days, that appears to have been his approach to the job. Twitter Trump remains impulsive, fiery and always spoiling for a fight. But especially over the past week or so, the non-virtual version has been downright traditional in his approach to foreign and domestic policy, both in substance and style. In some respects, this expectation-defying version of Trump started showing up even earlier than that. After trashing Democrats during the campaign season, he lavished praise on House Minority Leader Nancy Pelosi, D-Calif., after the midterms, making the case that her caucus should reward her for their victory by electing her speaker. He later used his bully pulpit to shine a spotlight on bipartisan congressional efforts to rewrite laws governing the re-entry of felons into society. Despite the widely anticipated wave of mass firings that was expected to follow the election, he has so far kept his White House staff and Cabinet largely intact, with former Attorney General Jeff Sessions, a longtime irritant to the president, the only major player who has been discarded in the month since Election Day. Rather than departing, White House Chief of Staff John Kelly — who has been viewed by outside observers as operating on borrowed time —joined the president's traveling party to Buenos Aires. "He’s governing and acting with more confidence in his own operation — because the president has never lacked confidence in himself," said Michael Caputo, who worked on Trump's 2016 presidential campaign. "He’s more confident in the advice he’s getting." It's not entirely clear what the White House got from China in exchange for holding off on a next round of tariffs for 90 days — details of the deal weren't set in stone or even, apparently, committed to paper — but U.S. producers and consumers will get at least a three-month reprieve. "Farmers are the canary in the coal mine and the farmers who support him have been telling him about the pain," Caputo said. "I believe he realizes what he is hearing from the farmers, he does not want to hear from consumers." At the same time, he said, Trump's negotiating philosophy is to try to find a way for the U.S. and China to strike a broader deal that allows both parties to claim victory. The timing of the shift would seem to suggest that Trump saw the results of the midterm elections, in which Democrats took control of the House, and decided that he couldn't win re-election by playing solely to his base — that he had to become less abrasive and offer more stability on policy to appeal to swing voters before the 2020 election. But those familiar with Trump's operating style say that's not really how he thinks about his job — that he approaches problems on a more day-to-day basis. And one person close to the White House expressed concern that this brand of flexibility — paired with the impetus to deal with the new Democratic majority in the House — might lead him to move into a bipartisan space that could put some distance between him and his political base. "This more bipartisan, lighter-touch Trump is a reflection of his want of being seen as a bipartisan president," this person said. "I actually think it’s the biggest potential danger to his re-elect because he’s not a philosophical ideological conservative. There’s a real danger that he could get hoodwinked into supporting things anathema to his supporters." Or it could be his best shot at persuading swing voters to give him another four years.